Hometown dates are my favorite. I feel like family can be a deal breaker and give you and insight into people. I still remember from Ali Fedotowsky’s season when Kirk’s Dad showed her the taxidermy room. Maybe she knew all along she would be sending Kirk home but after that date his fate was sealed. And who can’t forget how hard Desiree Hartsock’s brothers were on Sean Lowe. Maybe they saw a side of him we didn’t but everyone knew that after that date Des was headed home. This week family was a deal breaker and it’s hard not to jump right into Dean’s date. But first let’s talk about Eric. I liked their hometown date but nothing about it jumped out at me. Bryan’s Mom was a little over-the-top for me. She is definitely a mother-in-law who you would have to live up to and who’s shadow you could not shake. She is obviously protective of Bryan and Rachel handled this very well, I think she may have even won Mom over. I loved Peter’s hometown date. I loved his friends and family. I still feel like Peter isn’t there yet. I get the impression that he’s not really buying the process and would just like to keep dating Rachel. And Dean. Poor Dean, the boy has baggage, and rightfully so. I can’t imagine what it would be like to lose your Mom and then lose your Dad in a totally different way. While Dean’s Dad is still alive he’s clearly not present and hasn’t been supportive to Dean in years. I loved Dean but I felt like this date opened up a can of worms that he had bottled up inside him. It so clearly explained why he was so awkward on last week’s date with Rachel. Walking up to the house his anxiety was palpable. I was rooting for Dean but for me it felt like he needs to deal with his family issues before he can be in a relationship. I saw he is coming to paradise and while I wish him well, I don’t know if booze and beaches is the best thing for him. My gut tells me it’s going to come down to Peter and Bryan, though I feel like Eric might be the surprise winner. This weeks scores included the scoring for picking the top 4. Make sure you join our Facebook group, it’s the only way I can contact you if you win. The rest of the leaderboard can be viewed here. 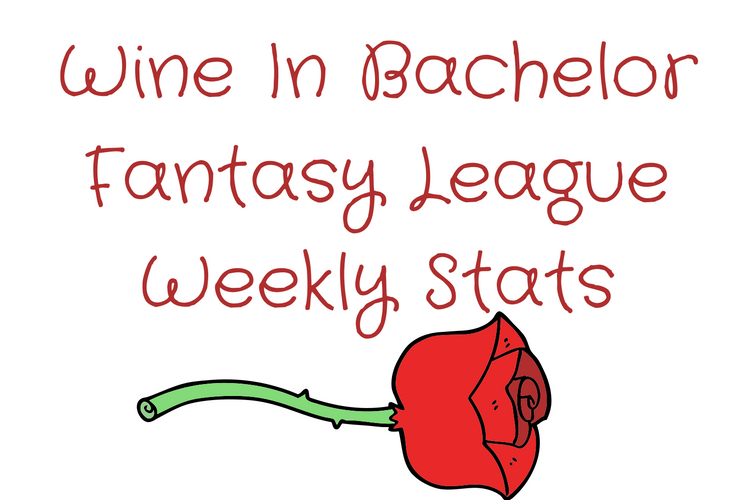 Join The Fantasy Bachelorette League Here. A Lipsense Starter Kit from Melissa’s Lip Smackers, make sure to join her Facebook group. Cocktail Coolers from Simply Melissa, make sure to join her Facebook group. True of False Bryan loses the watch Rachel gifted him? True or False a Bachelor will take a dip in the hot tub with Rachel on this episode? Which Bachelor has the pleasure of meeting Rachel’s family first? True of False all of the men ask Rachel’s mother for permission to marry her daughter? Which Bachelor meets Rachel’s friends in addition to her family?